My mother gave birth in the 50s and was told, like many women of her era, that her milk was “too thin” and that she should give formula. This was still a time when birth and breastfeeding were not widely discussed. When she was giving birth to me my mother remembers the woman in the next bed to her screaming all through her labour, not understanding what was happening or how her baby would come out of her body. She had gone through her whole pregnancy not understanding how she would give birth. I once asked my mother why a lady in the street was “so fat” and she hushed me in embarrassment, eventually whispering “She’s going to have a baby” like it was a terrible secret! Very different to the way many of today’s mothers-to-be are happy and confident with wearing fitted clothes that show off their pregnant bodies. I was four when my younger sibling was born and I don’t remember any particular discussion about it during the pregnancy but I did understand there was going to be a new baby. I do remember sitting at the kitchen table having a discussion about what the baby would be called and agreeing with my mother even though I did not like the name. I am not sure if that said something about my feelings for the new baby! My younger sibling was born at home. This was the norm for second babies at that time and my mother’s request to be in hospital was refused. What a difference to a few years later when women had to fight for a home birth. It wasn’t all calm and relaxed though. There were no phones in homes in those days and when my mother went into labour my father had to cycle to the midwife’s house to tell her. The midwife notified the doctor who came to see my mother and gave her an injection which the midwife said was to slow down her labour. The doctor had a round of golf booked and wanted to finish it before the delivery. Imagine the outcry if a mother found that had happened to her today! As it happened the baby did not wait and when the doctor came back the midwife had done the job needed. I don’t remember much about those early days but I do have a very vivid memory of the midwife asking me if I would like to see mummy feeding the baby. I was engrossed in a story about a rabbit on Listen with mother – a radio programme for children on at 2pm every afternoon, so I guess this was the ‘2 o’clock feed’. I said I would look when the story was over. “You’ll miss it then”, said the midwife. 10 minutes later I wandered into the bedroom to the strange and puzzling sight of my mother having cream massaged into her by the midwife. “I want to see the baby being fed” I said. “You are too late”, said the midwife. I don’t have a clear memory of seeing my mother breastfeed my sister, although she tells me she feed for about six weeks. I do remember her asking me if I could please rock the pram containing my screaming sibling for a while so she could try to get something done. 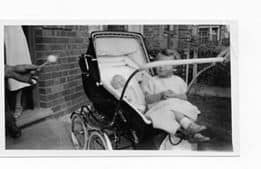 I spent a lot of time rocking the pram, when it wasn’t pushed to the end of the garden. This was what women were told in those days – put the baby at the bottom of the garden where you won’t hear it cry. In 1939 Marie Stopes had written a book called Your Baby’s First Year in which she advised that in the first month a baby would sleep for 22 hours a day. By the third to fifth month it would need 20 hours sleep a day, and from seven to twelve months 18 hours of sleep. These figures are clearly abnormal and unachievable and many mothers must have been in despair when they could not get their baby to comply. Mrs Frankenburg, Common Sense in the Nursery, (1922, 34, 54) told mothers than a baby’s lungs did not expand to their full extent unless they were exercised every day. ‘If Nature is regularly thwarted by some well-meaning person who picks up the baby and distracts his attention after the first squeak, there is a risk of the lungs remaining almost unexpanded!’ She adds for good measure the case of a baby who died of pneumonia at 8 months because he had never been allowed to cry at all! Leaving babies to cry because it is good for them is a long way from the calmness we aim for today, and yet some modern day “gurus” still cling to this idea. In her recently republished book The Baby Book “maternity guru” Rachel Waddilove says she teaches mothers that it is ok for babies to cry. In a comment which could be an echo of the statements above, she says “Very often a baby’s normal way to go to sleep is to have a shout, air their lungs. If you rush in you interrupt the pattern of them falling asleep”. It’s strange but I don’t notice adults having to cry themselves to sleep, or if they are I think they need someone to comfort them – just as babies do. Just because mothers left their babies to cry believing it to be the right thing didn’t mean their hearts weren’t breaking. Years later, as she watched me and my sister breastfeed our own babies, my mother said she wished I could have told her then all the things I was going to know in the future. She said she would give anything to be able to go back and change things, and that is a feeling many of us can understand. I imagine there are not many women who don’t look back with hindsight and wish some things had been different. My mother was already of a generation that had no family support for breastfeeding. Her own mother had sadly passed away after childbirth and her mother-in-law, my paternal grandmother, told me how my father just wouldn’t feed. “He just hung there like that” she said, letting her mouth hang open to demonstrate why he hadn’t been able to suckle. I wondered if perhaps tongue-tie (ii) might have been a problem but she certainly got no help from her doctor. He told her that the best thing she could give her son was Carnation milk, confiding that it was what his wife fed their babies on. Even though my grandparents were desperately hard-up they made sacrifices to ensure their son had ‘the best’. My grandmother’s breastfeeding experience, and my mother’s, were clearly still ingrained in their memory. ‘Experts’ can tell women to forget about bad birth experiences and not ‘being able’ to breastfeed but the memories are always there somewhere. Elderly women may forget why they went upstairs or if they had their breakfast but ask them about childbirth and feeding and the stories flow out as if it happened last week. We can’t change the past but we can work towards a future in which women who want to breastfeed do so for as long as they intended.